I'm baaaaaack! 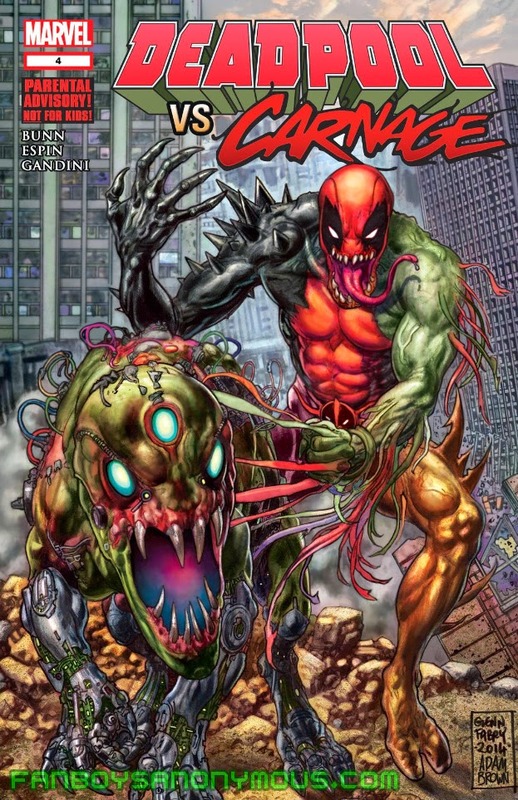 Welcome to my review of the final chapter in Cullen Bunn, Salvador Espin, and Veronica Gandini's Deadpool vs. Carnage limited series comic book. It's been a fun ride, but like all good things, this too must end. Let's start off like I always do, with a brief recap to catch you up. 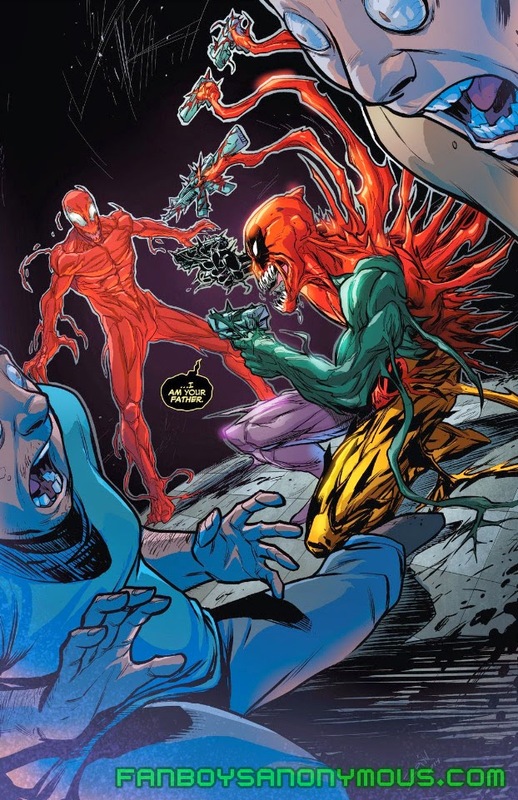 In Deadpool vs. Carnage #3, Cletus Kasady (aka Carnage) is beginning to experience a crisis of faith, thanks to none other than the hero of the story, Deadpool. He's been constantly harangued and hunted by the Merc with a Mouth these last three issues, who's been able to track Carnage by some ethereal method even Deadpool doesn't quite grasp despite the apparent randomness of Carnage's violence. Carnage's faithful partner in crime, Shriek, has been tagging along with him on his cross-country murder spree, but even she can't help Carnage shake his Deadpool problem. Even though Deadpool has been met with success in tracking down Carnage by riding the insanity wave, he only just discovered (or rather bonded with) the exact tool(s) he needs to finally end the serial killer's rampage after Mercury Team—four US soldiers bonded to Venom's symbiote spawns that were previously amalgamated into the superhero symbiote Hybrid—met a brutal end at the claws of Carnage. Issue #4 opens with Carnage and Shriek at a psychiatric hospital (a fitting venue) holding a few patients and a doctor hostage as Carnage grills them about his life-shattering discovery of the patterns behind his chaos. 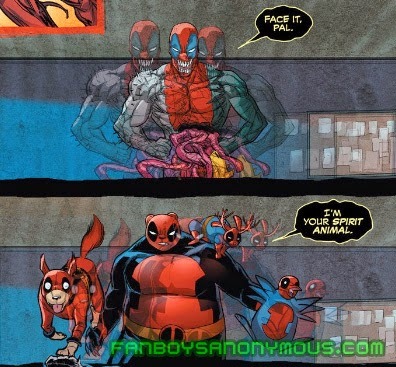 It's not long before Deadpool crashes the party like always, but takes no time at all to show off what he and his new symbiotic pals can do. This is perhaps the best part of the book for me; Bunn reintroduces us to what the Mercury Team symbiotes are capable of by allowing Deadpool to have his fun with Carnage. Deadpool's design with the four symbiotes isn't half bad, too. At least Espin gave the Merc his mouth. Deadpool is on point with his banter, as usual, especially with the pop-culture references and Southernisms that put Cletus' backwoods pedigree to shame. Bunn further proves that when he writes Deadpool and Carnage dialogue, he writes it naturally. Crazy meets crazy, and it's a beautifully scary thing to behold. Yeah…who says Carnage and Shriek aren't Marvel's Joker and Harley? Another way Bunn wins me over is his mindfulness to Carnage's fan base; he knows how much fans love the Carnage and Shriek pairing, and he makes Shriek an integral part of Carnage's story here. 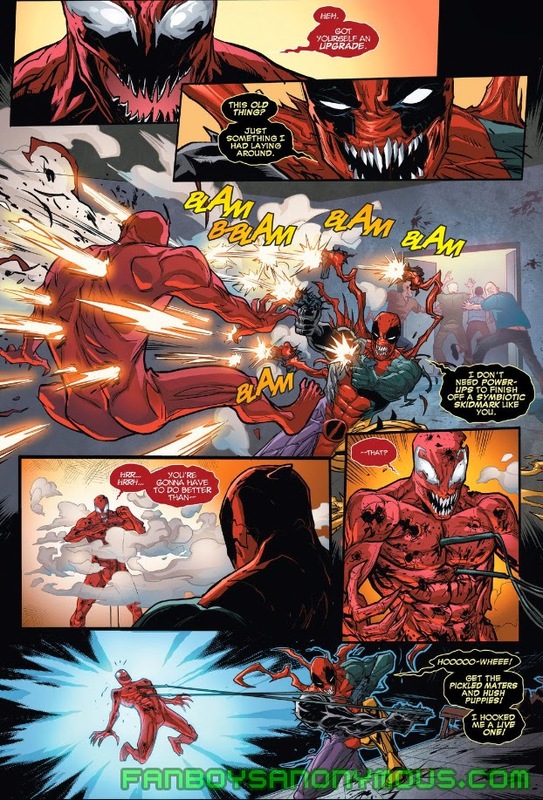 Even though Carnage may have been previously written to prefer being a lone killer, his relationship with Shriek has evolved exponentially since Carnage: Family Feud. She is the Harley Quinn to Carnage's Joker, and to further prove the point, Espin and Bunn even gave her a Harley Quinn-esque appearance in this issue with a nurse uniform and pigtails. The way Carnage's story ends in this issue may appear anticlimactic at first, but there's a certain gravity to it that makes it a smart, fitting ending. Bunn sets things up for a revenge-driven sequel, but so far there has been no word of another miniseries spawning from this one. Luckily, Bunn knows how much symbiote fans hate it when a writer ices symbiote characters (*cough* Rick Remender *cough*) despite how much we rail against the multitudes of throwaway symbiote characters. (Maybe that's just me; I hate it when more new symbiotes are created and doomed to obscurity, but can't bear to see them die.) Even though Mercury Team is dead, its symbiotes and the Lasher war dog survive the encounter, ensuring their reappearance at some point in the future. The writing in this issue may not have been as fun as in previous issues, but Bunn buckled down to deliver a solid, open-ended finale for the limited series. The story for issue #4 was less insane and more focused, which is okay with me; I like a little order to my chaos. The art was spectacular, as always, though the cover was still very much meh. I really haven't been a huge fan of Fabry and Adam Brown's covers for this series, and feel that veteran symbiote extraordinaire Clayton Crain would have been a far better choice for the covers. I'm just not that into the technicolor wackiness of Fabry and Brown's work. Deadpool vs. Carnage #4 gets 4.5 stars out of 5 for the writing and 5 stars out of 5 for the art. Overall, this limited series gets 5 stars out of 5, and is definitely a must-read for those who've been waiting for this matchup since the '90s. You can either read the individual books digitally on Comixology right now or wait for the trade to come out in about a month, but don't skip this book if you're a Carnage or Deadpool fan. Don't forget to follow Fanboys Anonymous for more comic reviews by yours truly, and The Venom Site for all of your symbiote news, reviews, and points of views!